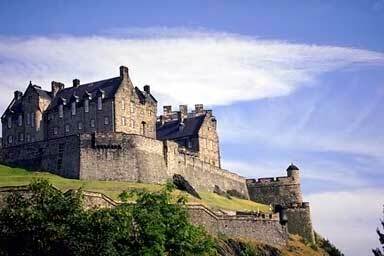 Edinburgh Castle is the most famous of all the Scottish castles and dominates the city of Edinburgh. It rises 300 feet above the valley, that is now occupied by Waverley Station and Princes Street Gardens. The castle has been a palace, a treasury, the home of Scotland's records, a refuge for several Scottish kings during their minority years, and a prison. The castle was begun in 1367 and includes several important buildings such as the Great Hall, which now houses a collection of weapons and armour. The Royal apartments include a small wood-panelled room where Mary, Queen of Scots gave birth to a son, who would become King James VI. Edinburgh Castle is also the site of the One O'clock Gun, which has been fired each day, except Sunday, at precisely 1.00pm since 1861, to provide an accurate time signal.